Image source: Seaweed collected near Jersey, England, during the 1850s. From Collectors Weekly. Imagine you’re a human tofu cube marinating in a giant bowl of miso soup. Well, that briny, umami broth is pretty close to what it’s like to take a seaweed bath. This episode, we explore seaweed bathing, Ireland’s only indigenous bathing tradition, and how this edible sea vegetable has played a role far beyond the bathtub. We trace seaweed’s slippery history from an essential crop on the emerald isle, to it falling out of favor with the arrival of the potato, to its vogue as a vitamin rich tonic in Edwardian seaweed baths. We also speak with edible seaweed evangelist Dr. Prannie Rhatigan about her mission to bring the versatile sea vegetable back to Irish plates. Finally, we wrap up with a look at the bizarre Victorian seaweed scrapbooking craze. Thanks to Dr. Prannie Rhatigan for sharing the culinary secrets of edible seaweed with us! You can learn find recipes for delectable seaweed concoctions on her website, the Irish Seaweed Kitchen that include sachets with samples of Irish seaweeds, so you can spread your newfound enthusiasm for sea vegetables far and wide! 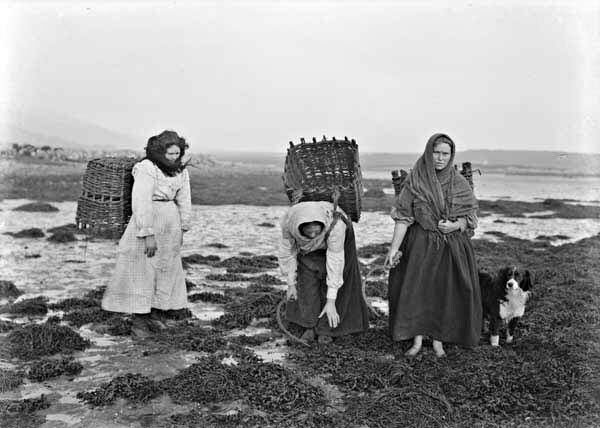 Header image: Gathering Seaweed on the Irish Coast , National Library of Ireland. Go straight to the source and visit Voya Seaweed Baths in Standhill, Co. Sligo or the Enniscorne Seaweed Baths, the oldest one still operating in Ireland! Want to incorporate more seaweed into your cooking? This guide breaks down the common seaweed pantry. Get inspired to start your own seaweed scrapping craze with these breathtaking and bizarre seaweed albums. And you can hum this Irish folk song about foraging seaweed while making some sea spaghetti.